Love those large, soft, and gooey cinnamon rolls? I do too but can never finish the whole thing. Sometimes I just want a bite! These mini cinnamon roll bites are quickly made with the help of puff pastry. Sprinkled with brown sugar and baked until golden brown, they are crispy on the outside and flaky on the inside. Top them off with vanilla glaze for the perfect bite! Ever been to the airport and run by the cinnamon roll shop? Tempted to eat one or three or seven? I am! My son is also a cinnamon roll freak! 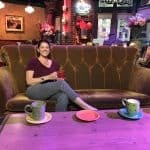 There is a local cafe that serves great cinnamon rolls and he always eats one when we go. But just the center. He literally takes his fork and eats from the center out. He leaves the last two rings on the plate. Guess who gets to eat that circle of crispy, sugary goodness? ME, ME, ME! I love that he shares with me. He’s growing so fast he usually eats everything on the plate. He’s still very picky about what he eats, but if he likes it, he eats ALL of it! A few of the other things he eats all of are my Cinnamon Stars and my Fall Spiced Nuts. He can’t keep his hands off either of these two and has me make them for his friends at school too! Just take me to the Puff Pastry Cinnamon Roll Bites Recipe Already! 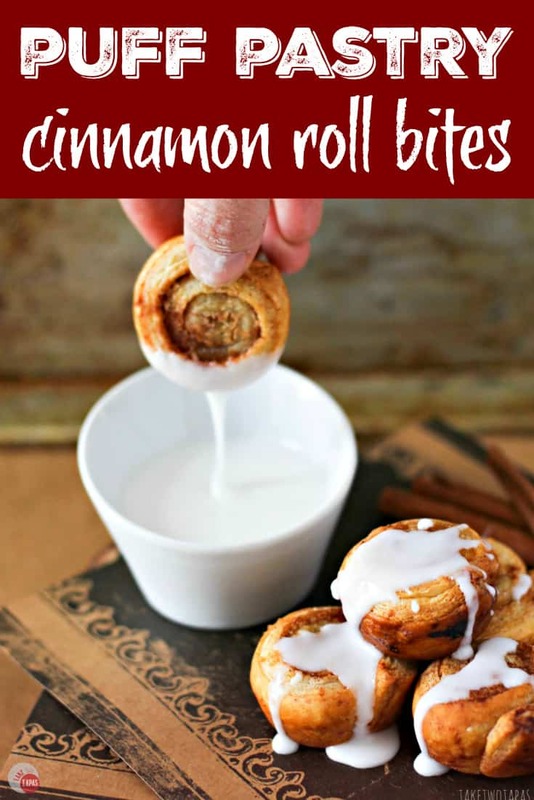 If you’d rather skip my (very helpful, I think) tips and tricks, essential cooking info, and similar recipe ideas – and get straight to this delicious easy Puff Pastry Cinnamon Roll Bites recipe – simply scroll to the bottom of the page where you can find the printable recipe card. Back to those gooey cinnamon rolls. I have tried to make them from scratch but tend to get impatient, kneading and waiting for them to proof. Then you still have to bake them. Yes, they are a labor of love, but sometimes I just want the love, not the labor. They even make a no-rise hot roll mix that you can use as a shortcut, but still not as good. I tried making them the night before, letting them slow proof in the fridge and then baking in the morning. I’m sorry, but I am too hectic in the morning to worry about getting up 30 minutes earlier (because who wants to do that), doing a quick proof and then baking. Still too much trouble!!! Why is puff pastry so great? Enter the puff pastry! I just recently showed you how easy it was to use puff pastry in my Corned Beef and Swiss Pastry Sliders. I do love a great shortcut and I am no Julia Child. I figured that I could use this same great shortcut in making my cinnamon roll bites! Defrosting a package of pastry in the fridge overnight makes for an easy morning. I haven’t tried rolling the cinnamon rolls the night before and then slicing in the morning, so if you do, please comment and let me know how that goes. Even with my hectic mornings, I have time to spread some cinnamon and brown sugar, and slice and bake these mini cinnamon roll bites. I will use the time they are baking to find my son’s shoes that always seem to go missing as soon as we need to leave the house for school. Even when I put them by the door, they end up in the Bermuda Triangle of our house. Are these cinnamon roll bites portable? 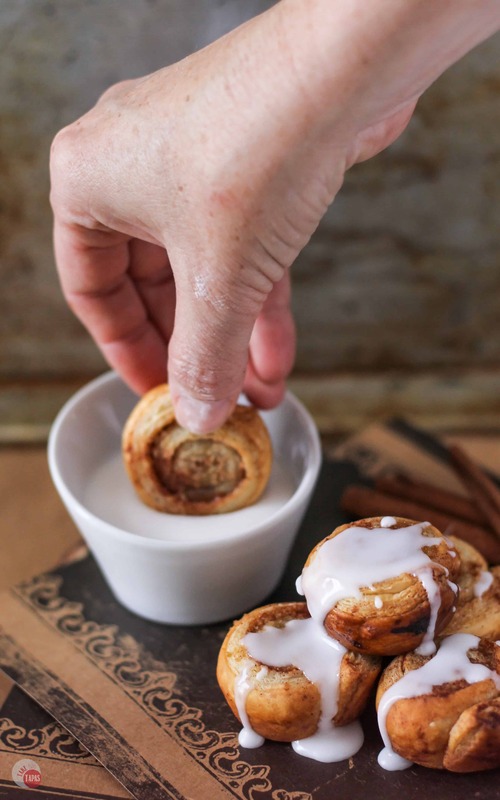 These cinnamon roll bites are also a perfectly portable breakfast! I can grab a few, toss them on a napkin or paper plate, and the kids can eat them in the car. Usually, because we are running late because we couldn’t find our glasses or last night’s homework. Fresh out of the oven, they are crispy on the edges, buttery and cinnamony on the inside with a slightly chewy center. Drizzle them with the vanilla glaze, use it as a dipping sauce, or just leave them plain. The brown sugar can be sweet enough as it is. Looking for other breakfast options for holiday parties or tailgating? Check out these fun and easy breakfast recipes that you can make ahead! If you love this easy Puff Pastry Cinnamon Roll Bites Recipe as much as I do, please write a five-star review in the comment section below (or on Pinterest with the “tried it” button – you can now add pictures into reviews, too! ), and be sure to help me share on facebook! 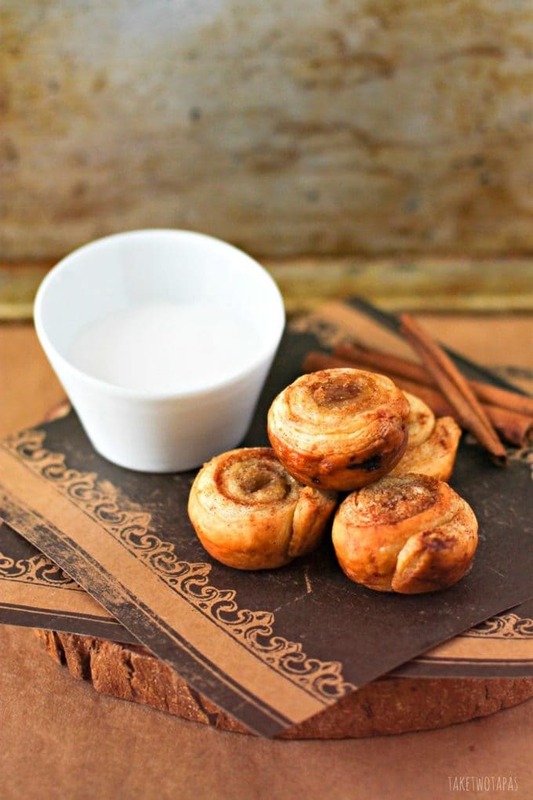 Other great Cinnamon and Puff Pastry Breakfast recipes to try! A: Yes they can, but leave the glaze off and make sure they are sealed in an air-tight container. These are small and will dry out quickly. Q: This seems like a lot of cinnamon mixture? A: I have had a few people mention that the cinnamon mixture is a lot and they are only using half of it. Feel free to make only half or make the full amount and save the other half for another batch! Q: Can you roll them out and cut them but not bake until the next day? A: Yes you can, just make sure that when if you cut them and put them in a pan, that they are sealed tight and placed in the refrigerator. 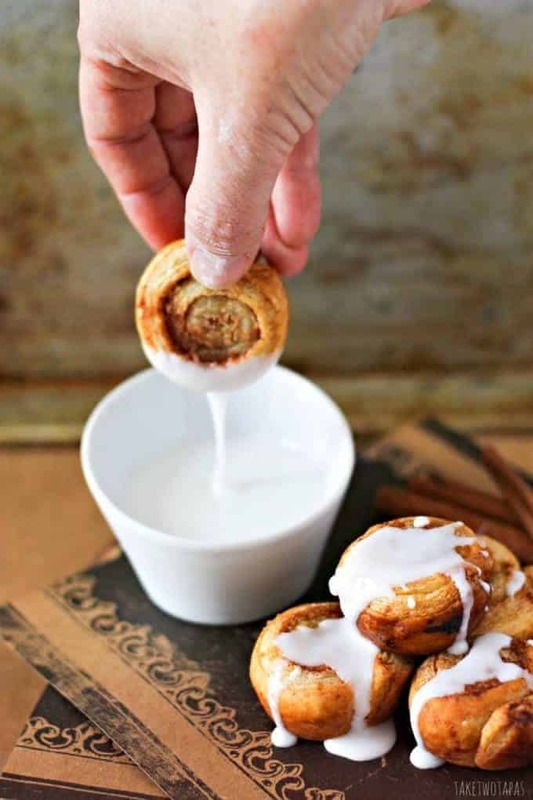 Will you eat these Puff Pastry Cinnamon Roll Bites for breakfast, a snack, or dessert? These mini cinnamon roll bites are quickly made with the help of puff pastry. Sprinkled with brown sugar and baked until golden brown, they are crispy on the outside and flaky on the inside. Top them off with vanilla glaze for the perfect bite! Spray your mini muffin tins with non-stick spray. Unfold one sheet of puff pastry, with the fold lines in an up and down direction. Spread the puff pastry with 3 tablespoons brown sugar and 2 tablespoons cinnamon. Spread to the edges with a brush or your hands. Roll from the bottom up until you have a nice tight tube of cinnamon roll goodness. Cut into 12 slices, using the fold lines as a guide if you need to. Place each slice in a muffin tin cavity, flat side up so you can see the swirl! While the rolls are cooling, mix the glaze. Serve warm with the glaze! I think I know what I’m making this weekend! I have everything on hand and cinnamon rolls are my favorite! LOVE anything having to do with cinnamon rolls… especially when they’re bite-sized and come with a vanilla glaze! Can’t wait to try these! Is there really anything better than a well made cinnamon roll?? These little beauties look perfectly popable!! How delicious, these are these are just the perfect bite and I love the small serving size – using puff pastry is a great shortcut and makes these that much better! These cinnamon roll bites are too cute for words and the PERFECT amount when you want a treat, but don’t want to over do it! I can just smell these baking…yum! Just wanted to pop back over and say we are still making this and its still one of the best cinnamon roll recipes EVER! Thanks again for it! You’ve made our Saturday Mornings the absolute best! I love puff pastry. And this little special treat looks like a fun way to use it! Little appetizer treats for brunch are so fun! These are so cute and would be the perfect little sweet bite! Although I don’t think I could stop at just one! SUCH a great idea to use puff pastry for these! These look so up my alley! Cinnamon rolls are my favorite food! Bite size cinnamon rolls are perfect for me too! I don’t get good results making my own pastry dough, so this recipe is going to happen soon! Cinnamon rolls are always a favorite in our house, my husband will love these! Bite-sized and dippable, a perfect combo in my book! Puff Pastry is a brilliant idea for cinnamon rolls! Takes all the time out of waiting for the yeast to rise! Im so making these VERY SOON! Oh these little cinnamon rolls are too fun!! I cant wait to make these! My boys are just going to love them!! It is definitely a different texture. Not bready but crispy! Go ahead! My son blames me too! These sound so incredibly amazing! I love cinnamon rolls, but making a large batch kind of makes me nervous 🙂 I might be able to handle these ones! I was just craving cinnamon buns earlier! I seriously have got to make these. Yummy! These are beautiful!! LOVE cinnamon rolls and this is such an easy way! Gorgeous 🙂 Pinning! Looks so yummy. Pinned & shared.Thanks for sharing at the Inspiration Spotlight party! I do something like this with a savory twist, so you know I’m gonna love this sweet one! That glaze looks sooooo good, too! Seems like puff pastry is the vehicle of choice:) It is for me, sweet or savory! These look AMAZING!! Thanks for sharing on the #BloggersGetSocial Get It Together link party! These are so freaking adorable, not to mention delicious looking! I just love mini desserts! These are guilt free because they are tiny! Eat away! We’ll be eating these for all 3! Figuring out how to get just the center of a cinnamon roll is pure genius! Thanks for sharing! These are too cute! I love mini everything! Thanks! My kids love anything bite sized for them! I love cinnamon rolls too! They’re one of my weaknesses! Love these mini ones and that glaze is perfect! I was thinking I would be eating less but I ate so many of these that it didn’t work out. They were like chips, I just couldn’t stop! Literally the perfect little sweet snack if you’re looking for something to enjoy with your tea or coffee in the afternoon or after dinner. Would be great if you had people over as well as a small dessert! Better than a tea cookie for sure! These are too cute! Love the idea of dipping them 😀 Much more fun! I love keeping my kids busy when they eat and if you can dip something they are more apt to try it! Puff pastry is the best invention! These look absolutely delicious and so easy to make. A great way to enjoy cinnamon rolls without all the work. I agree! Like ready made pie crust only better! These are such a cute idea! I love the whole dippable aspect – and definitely a dessert for me. They look hard to resist in the morning, but I think I’d have to hold out. They are really an all day kind of snack! My daughter Ella would love these. Pinned and shared. They are so fun to make with the kids! You can do it with ready made Puff Pastry! just roll and slice! Your cinnamon roll puff pastry bites were delicious!!! I want mine for breakfast, brunch or dinner with a bowl of chili! These rolls look delicious. All of those sound perfect!